Phuket is blessed to be surrounded with a wealth of wonderful places to visit in our southern region. From the beauty of the national park at Khao Sok to the wondrous seascapes of Phang Nga, there is much to explore in the neighbouring provinces off the island. Respectful, Loving, Self Sufficient - The core values of the school founded for local children with learning difficulties. Photo: Uma Jacklin. The school’s programme includes education, vocational skills and healing massage. Photo: Uma Jacklin. A visit to the Eco-Logic Resort has a community feel and range of activities to support the foundation.Photo: Uma Jacklin. The site has a range of accommodation options from backpacker dormitories to selfcontained bungalows. Photo: Uma Jacklin. 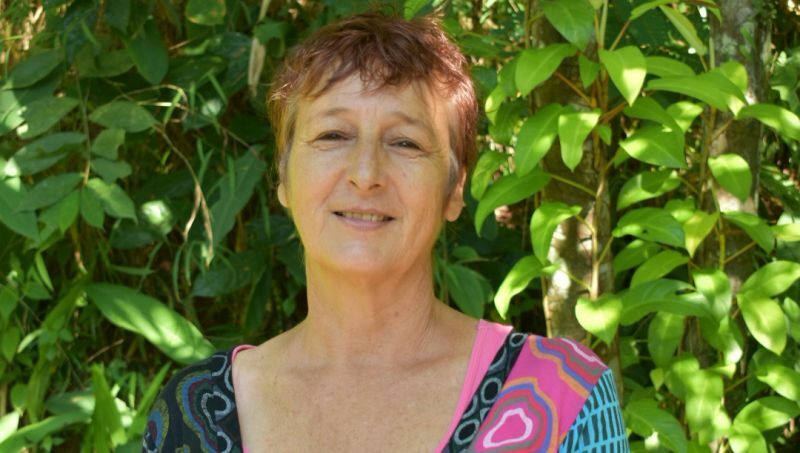 Ingrid van der Straaten, Co-founder. Photo: Uma Jacklin. For those searching for something a little bit different that mixes our need to explore, our desire to relax, but also has a ‘feel good’ factor that will have us glowing on our return… Eco-Logic, Resort for Charity, near the city of Ranong, may be just the ticket. 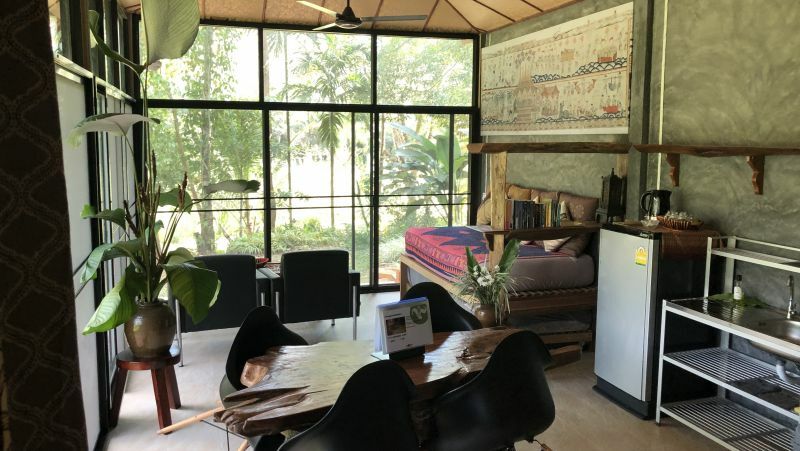 Eco-Logic is a family-friendly nature retreat located over 40 rai in the middle of the jungle in Paksong (Chumphon Province) on the west coast, around a five-hour drive north of Phuket. Eco- Logic stands in a stunning ‘return to nature’ setting, but the experience is so much more. The resort promotes the mantra ‘Relax, Experience, Learn’, and it is the ‘experience’ and ‘learn’ aspect of their offering that sets the resort apart from anywhere you are likely to have visited before. Eco-Logic is an inherent part of the Thai Child Development Foundation (TCDF), a charity that provides special medical care and education for children with physical disabilities, learning disabilities or social problems. The founders and their teams work both aspects into a symbiotic relationship and unique experience for visitors and residents from the same location. Invited by the co-owners, Ingrid van der Straaten and Rosalie Tieges, I took my family up for a two-night stay over the festive break, excited to hide out in the jungle, intrigued by the new wave of ‘voluntourism’ and its growing appeal. Even the trip north calms the nerves from the tumult of Phuket with qual­ity roads, minimal traffic and a scenic backdrop that makes the road trip pass in a jiffy. 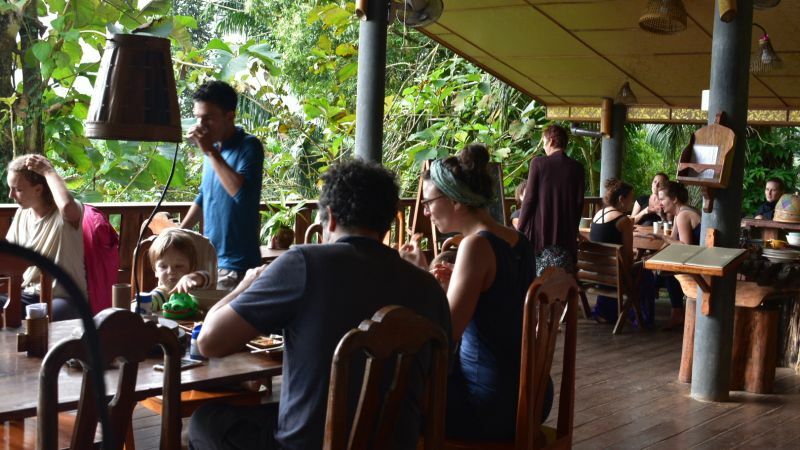 Khao Lak provides an ideal pit stop for lunch and a stretch. And for those without a car, the on-foot traveller can jump on a bus from Phuket Town for a six-hour ride, and the resort will pick you up from the nearby main road junction. On arrival you get an immediate sense of a well organised co-operative. Not just from the staff and visitors, but from the village and wider community at large. To begin with, it is an idyllic setting. The resort and foundation are nested within the landscape and cover of the surrounding jungle. Areas open out naturally to the sunlit river that winds itself around the estate. There’s an im­mediate community atmosphere and we’re duly welcomed by passing staff and visitors alike. You get a sense of a self-sustaining resort as you pass the organised agri­culture plots, farm animals and energy-production systems. There is an air of a well-oiled natural machine. There are a range of accommodation options at the resort, and my daughter, Uma, and I are placed in a fantasti­cally spacious and artistically decorated ‘jungalow’ (see what they did there? ), hugging the mountain, and looking out from its vast windows across the wind­ing river just a stone’s throw away. If it’s your penchant, you could while away your entire stay here entranced with the wonderment of nature and your undisturbed proximity to it. Your jungalow also comes equipped with its own little garden, sitting area and fire pit. 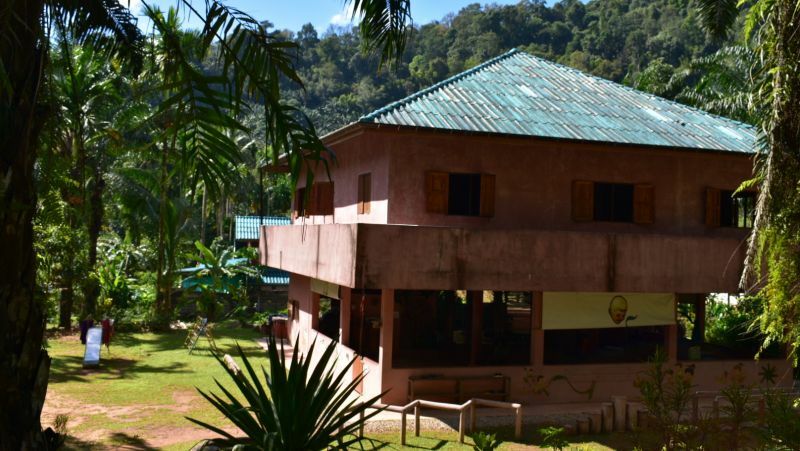 But the resort also offers a range of activities that enhance the nature-seek­ing visitor’s experience, including yoga sessions, massage, detox programs, jun­gle treks and natural hot spring visits. The resort restaurant is a friendly hangout space with open terrace views across the estate, as well as providing both a communal dining option along­side personal a la carte and beverage needs. If not satiated enough by this much natural indulgence, just wait until you see the vast night sky, stretching out across the mountain tops with the most stunning cast of uninhibited stars, and a supporting actor of the Milky Way if you’re lucky. Even the early morning has its treat, as the thick mountain mist rolls across the river, enveloping our jungalow in dense cloud, before clearing away to re­veal the source of the surrounding cries and squawks… the ever-present jungle. All in all, it’s a perfect family getaway. I met with the co-owner, Ingrid, to discuss how this incredible project unfolded. Ingrid and Rosalie origi­nally came to the area to teach in local schools. They felt compelled to work with the community to provide support and facilities for children in need of spe­cialist education and medical attention. From their own investment they bought the land, an old plantation, in 2006, and developed the infrastructure and facilities organically, as time and finances could afford. In 2010 Ingrid and Rosalie were able to start an education program for special needs children, which today covers the essential needs for children within a 45-kilometre radius, and a school that has 25 children enlisted as students. The education program and occupa­tional training includes skills such as farm maintenance, craft mak­ing, guest house and restaurant services… all providing vocational learning and future work opportu­nities. Ingrid terms the ideology be­hind the entire commercial aspect of the venture as their ‘Vision Mis­sion’, with 100% of all funds raised via a range of programs, sources and investments going directly to support the children’s needs. The entire ethos of all aspects of the working resort is based on the ‘Permaculture Flower’ model, developed by David Holmgren in the 1970s, which integrates ethics, design systems and ecological solu­tions into a sustainable culture. Eco-Logic and the TCDF is an incredibly efficient and em­powering example of a working community under these principles. The charitable intention and care of the entire team of 20 people who work the land, teach the children and support the activities is inspir­ing alone. Seeing how this all permeates to the success of running their own agricultural program and self-sustainability adds another level of inspiration. An on-site farm that feeds the restaurant and school, chicken excrement that is turned into a methane gas resource (yes really), an aquaponic system in which fish waste provides an or­ganic food source for plants, and the plants naturally filter the water for the fish, a recycling bank which services the entire local community, ground coffee production and a traditional clay hut building project that provides homes as well as an education into this forgotten, but environmentally friendly building process. If Ingrid and Rosalie aren’t busy enough, they have plans to expand, and they would love us all to get involved. TCDF requires continual financial support to sus­tain their adventurous ‘Vision Mission’ program, and the ‘Holiday for Charity’ ethos is the ideal opportunity to support an incredible cause whilst benefiting from this unique resort-stay experience and its surround­ing environment. Every single person that comes to stay financially supports the program, but there are also greater opportunities for longer-term involvement and invest­ment. The ‘Adopt a Bungalow’ scheme invites individu­als to invest money in a time-share style approach to building new accommodation or renovating current buildings. Investing in a ‘home away from home’ pro­vides the ideal holiday location for family and friends, as well as funding for such a good cause within the foundation. Eco-Logic are also calling out to companies with a Corporate Social Responsibility plan to get involved with the foundation for team building or away days, which the resort can either organise or host. However we want to be involved, Eco-Logic and TCDF is a glowing example of two people’s vision and their partners’ and teams’ commitment to make a lasting difference to both those in need and those that can help. And in the process, we all get to experience some­thing that no money can buy: a loving community upheld and in harmony with its natural environment and resources. What's missing? A Thai charitable foundation registration number. without which an entity's use foreigner volunteers is legally suspect. Go to the site, hardly any way to contact these people, either. Be careful who you give money too.